Thursday April 11, 2019-A man who was arrested with Sh 2 billion fake cash at Barclays Queensway’s deposit box now wants police to produce the money in court. 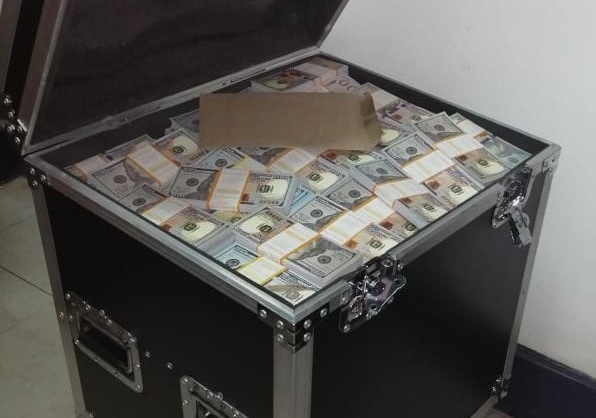 Mr Erick Otieno Adede, a lawyer and an international consultant, wants the Director of Criminal Investigations (DCI) compelled to present the contents of the safe box in court, saying the $20 million he stored in the box was genuine. Through his lawyer, Martin Oloo , Adede alleges the DCI is illegally holding sums of monies which do not form part of charges he is facing. “It is just and equitable that the applicant be heard on a priority basis so that his grievances be remedied without delay,” he said. Mr Adede was arrested on March 19, alongside traders Mohamed Ejaz alias Shah, Mary Wanjiru Mwangi alias Elizabeth Muthoni and Irene Wairimu Kimani. They all faced a joint charge of conspiring to defraud businessman Mr Muriithi Materi Mbuthia of Sh20 million at the bank's Queensway branch, while pretending to be investors. Adede was freed on a Sh1 million cash bail and the rest on a cash bail of Sh300, 000 each. The criminal case is set to begin on May 9.
they saw the money was a large amount and cos it was owned by foreigners - they schemed to rob they guys clean by framing them as usual of their traits.